University of Tokyo researchers genetically engineered rice that does not flower until it comes in contact with a specific fungicide. The results are published in Nature Plants. 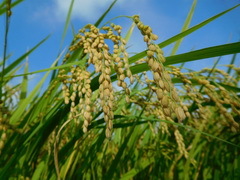 Takeshi Izawa and colleagues developed non-flowering rice plants by overexpressing a floral repressor gene (Grain number, plant height and heading date 7) to block natural flowering. Then they co-transformed plants with a rice florigen gene (Heading date 3a), which is induced by particular agrochemicals. Plants that undergo a longer time of vegetative growth exhibited improved plant and panicle size as well as other yield-related characteristics. The results of the study can lead to the development of crops that can grow in different climate types and facilitate breeding for different agronomical characteristics. Read the research article in Nature Plants.